Alongside the commercial cinema of narrative and spectacle there has always been another practice – call it avant garde, experimental or artists' film (as opposed to art cinema). 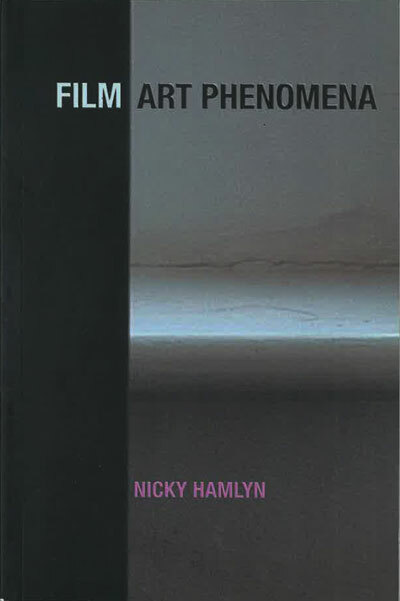 It is this work that Nicky Hamlyn, himself an acclaimed filmmaker in the alternative tradition, investigates in Film Art Phenomena. The work takes its cue from modern trends in other artforms, notably painting and sculpture. This is filmmaking that emphasises the nature of its apparatus and medium in order to bring about a critical, inquisitive state of mind in the viewer. It deconstructs, anatomises and reimagines what film images are; it builds new machines; it recreates the setting of cinema or expands into new kinds of performance and exhibition. It often has a political dimension – urging audiences to make a free and active response, not a passive, consumerist one. Hamlyn's major new study treats artists' film conceptually in order to explore key categories that connect different works and filmmakers: from framing to digital media, installation to interactivity, point of view to sound. In so doing he considers the work of Stan Brakhage, Malcolm Le Grice and Michael Snow, as well as younger artists such as Karen Mirza and Brad Butler, Jennifer Nightingale and Colin Crockatt, among many others. Film Art Phenomena is a crucial intervention in debates about the modes of filmmaking that diverge from and oppose the mainstream.